MBM-Consultancy provides maritime naval architecture and maritime consultancy services for shipowners, shipyards, offshore, oil and gas, and the wind industry, in order to modify, maintain, operate and design new commercial vessels. The company’s in-house experts offer a full comprehensive range of naval architectural services primarily for the commercial sector of vessels, aimed at assisting with conversion, modification and operational activities, as well as new build vessel design. MBM-Consultancy’s engineers perform a broad range of services, ranging from full vessel design to feasibility studies, that confirm vessel fuel costs can be improved by modification of a bulbous bow. MBM also undertakes projects that require the conversion of the offshore support vessel (OSV) deck to become a full-time operational cable layer. 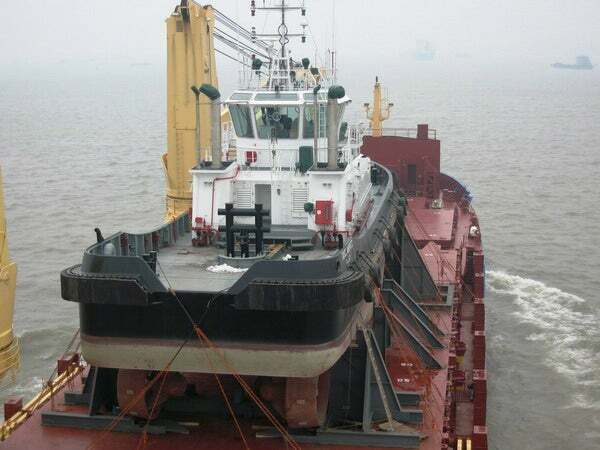 Also, MBM has undertaken the conversion of an open top barge (100m x 26m open area), and designed a singular cover to convert the vessel into a heavy project carrier with a 10t deck carrying capacity. All manufacture drawings, stability booklets, general arrangements and capacity plans were renewed and updated at the MBM office in Leer. MBM undertakes many other projects in-house including power / propulsion, bollard pull, structural, moorings, stability checks, and motions assessments for ships, including heavy-lift and multipurpose cargo vessels and barges. The company evaluates damages from grounding, deck / hatch / linkspan strength, modifications, and heavy-lift transport engineering to load on ships. The company’s highly trained, qualified and skilled personnel use a variety of state-of-the-art software to review and survey the acquisition and purchase of a new vessel. This process involves identification of vessels’ structural hot spots and weakness, their lifespans, and whether their machinery is due for maintenance or has internal vibration issues that suggest poor upkeep, which may cause the ship to fail classification or not meet all regulations. As part of its structural analysis, MBM-Consultancy provides concept, preliminary and contract ship designs, as well as weight and cost estimations, conversion plans and feasibility studies. The company’s structural design stage is based on tonnage measurement and load line calculations. Its designs also comply with Safety of Life at Sea (SOLAS), the International Convention for the Prevention of Pollution from Ships (MARPOL), and classification society regulations. MBM-Consultancy uses a variety of methods for its structural analysis, including finite element analysis (FEA), 2D wire frames, 3D solid modelling, and first principles. The company facilitates the transportation of heavy-lifts and project cargo with a range of consultancy services, including designing sea-fastenings, grillage and load-spreading systems. It also offers analysis of hull and deck strength and motion response, as well as feasibility studies, ballasting calculations, and stowage and project management. MBM-Consultancy provides analysis of a range of factors affecting vessels, including free-surface, sea-going and wreck removal from grounding conditions. The company analyses vessels’ capabilities in mooring, sea-fastening, loading and lifting, and rigging. MBM-Consultancy creates computer-generated 3D models of a vessel’s hull form with compartments and tanks to assist with damage and free flow fluid analysis. The company predefines environments for its inspection, and provides results in several different formats. The company’s employees survey the vessel tanks, integrated compartments and loads, as well as standard and customisable stability criteria for vessels. As part of MBM-Consultancy’s motion analysis, the company calculates response amplitude operators and resistance, as well as motion, velocity and acceleration at specified positions on vessels. MBM-Consultancy provides presentations and interactive graphs to demonstrate its results. It also offers hull design optimisation, propeller and rudder selection, sea-keeping and manoeuvrability studies, and tank test coordination and supervision. The company’s experienced graphics team creates drawings for new builds at classification approval standard, and recreates lost drawings for existing vessels. It can also adapt drawings from word document or PDF formats to a more modern .dwg version. Vessel drawings provided by the company include general arrangement, capacity plan, scantling, linesplan as well as all electrical, piping, construction and classification plans. Assembly, reverse engineering, 2D CAD and paper-to-CAD drawings are also readily available. MBM-Consultancy offers a comprehensive range of graphic services, including 3D modelling for vessels, cargo, hatches and transportation structures. The company creates short film animations for a range of purposes. Simulation is helpful for operational procedures, visual awareness of surrounding obstacles, health and safety, personnel training, presentations and project feasibility. As an example MBM-Consultancy provides reports, slideshow, powerpoint notes, combined with the 3D animations to ensure clients are aware of a loading procedures. The animations allow clients to simulate and examine the real-life heavy-lift scenario. Then discuss potential issues, potential safety hazards, loading sequence alterations, allowing them to plan ahead and be focused and safe. MBM-Consultancy provides cost-effective, high-quality, accurate 3D models of vessels in a format to suit the client. The company’s engineers are experienced in using specific proposals, sketches and drawings to quickly produce models. MBM-Consultancy offers solid and surface / wireframe 3D models for finite element analysis (FEA) purposes. Solid models are used by engineers to produce simple animations, drawings and graphical representations for FEA analysis. The company aims to quickly produce accurate models using a carefully selected suite of graphic softwares. Surface wireframe models are normally used for visual and animation purposes. MBM-Consultancy uses high-quality materials to produce visuals, animations and marketing materials. MBM-Consultancy assists shipowners with dry-docking operations by ensuring that information collected from all parties (including shipyards classification, original shipowners, and manufacture yards) is current and accurate. MBM-Consultancy analyses many vessel types, with or without cargo. It uses original vessel docking plans to evaluate potential positions for centreline keel and offset blocks. Vessels are carefully examined to provide the best possible solutions for cleaning hulls. The company determines forces during the initial contact between the keel and the first block, up to and including the ‘knuckle load’. It provides clients with ‘step-by-step’ methods for raising vessels out of the water / draining water from the dry dock. During MBM's 'Sand Carrier - Open Barge' conversion project, the client aimed to convert a vessel from one service sector to another, by an innovative design of a steel structure that covers the open hold of 103m x 21m to allow transport of project cargo using approximately 600t of steel, that may be removed in the future for the vessel to return to its previous operational service sector with minimum re-work (for example, leave all machinery operational and in place). Norwegian Cruise Line's (NCL) Norwegian Epic is the cruise line's biggest and most innovative ship to date. 'MBM OFFSHORE VESSEL 1' is an ongoing project that is generating high interest due to the change in focus of the maritime market.